Essex Probation operates from seven offices across the county of Essex. Having previously relied upon individual offices to make procurement decisions, Essex Probation decided that they would benefit from some professional advice to ensure that they were aligned with best practice and achieving best value. In 2008, Debbie Came, Director Finance and Business Management at Essex Probation, called in Expense Reduction Analysts, and it was agreed that the first categories for analysis should be Office Stationery, Printed Stationery and Couriers. Fixed Telecoms was later added to the remit. 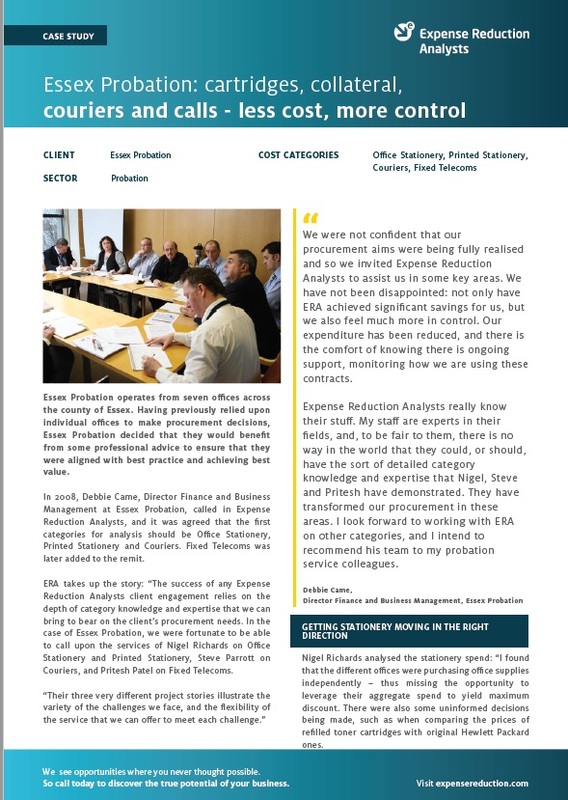 To find out more about how ERA helped Essex Probation, including results, savings and more details from the client, download the full case study now.